She Touched My Belly Bump – Really? During my final pregnancy, my belly bump developed about the fourth month of my pregnancy. I was pregnant with twins and that meant showing early and showing big. By the fifth month of pregnancy, strangers started asking when I was due and by the seventh month, people were spontaneously touching my baby belly without even asking if it was okay with me. One day, without even thinking about my reaction, I smacked the hand of a complete stranger for touching my baby belly. That was completely uncalled for, but what is the right reaction and how many times does it take before you’ve had enough? 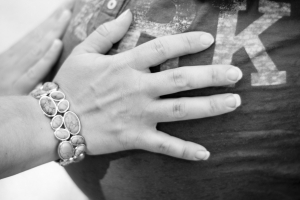 Here are a few tips for addressing the baby bump touch and a few quote from friends about how they handled the situation. If someone touches your baby bump without asking if it is okay, simply be calm and ask them not to touch your baby bump. If they proceed to touch it again, turn and walk away from the situation. While I can give you all the tips in the world, why not hear tips from other moms with a bit more patience than me. At the end of the day you may hate that someone touched your belly or you may love it. If you’re not too keen on spontaneous touches – try to keep your calm and walk away or tell the stranger you’d rather them not touch your belly. Most of the time, however, pregnant women just take the touches as part of the pregnancy adventure.